If it does, could it cause the manor to not show up or the quest marker for the drafting table to not update? In the past (with LE), adding spawn points to the cell where the manor was located caused the same issue. EDIT: Didn't read the bug tracker first...just did and I saw someone else had the same issue. Will uninstall and report back. EDIT 2: Definitely this mod...removed it and the main hall appeared...except it borked the save game so much that the small house that turns into the entryway is not appearing at all and the BYOH quest is stuck. Oh joy!! To the author...nice mod...do NOT put spawn points next to anything non-landscape, especially things added by the DLCs. big Y I K E S good to know. Thank you for bringing this to my attention, i will make a patch as soon as possible removing the chest at that location. EDIT:Patch is out, it should fix the issue but if it persists please let me know. Tracking this for now. Love stuff like this that rewards for trying to explore spots I wouldn't normally go. Please make some chests underwater out in the middle of nowhere in the ocean...that are really hard to find! Just a note...I have discovered two of the chest so far. No problem except that in both cases some of the bandits had black faces. Any idea on how to fix this? I'm not sure what would cause that it may be another mod you have installed if you have any other mods installed. I do have some that may target face gen but they target specific females only - Bijin and The Ordinary Women. I also have CBBE. Maybe EEO? It might be that. I would suggest testing it but maybe make a backup save for your game just to be safe before testing. There are not many mods like this so his is a welcome addition. How many are added at this moment? The chests out in the open seem a little weird. like they don't organically belong there. Maybe add a shovel to a bandit to make it seem like they were going to bury it. Or make it seem like they attacked a cart or some travelers or like they are just camping there. The ones that are already in a hidden place (like the tree) do not need this. 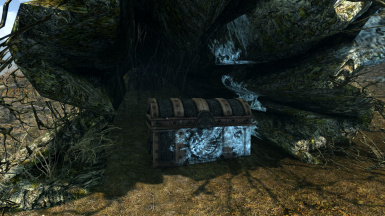 I would like to see treasure that rewards exploration so maybe add some chests that are not guarded (with the loot leveled to an extent for balance reason). 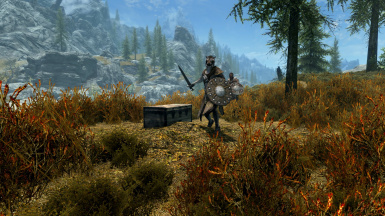 Maybe add more type of containers, skeletons of dead adventurers or even singe items for players with keen eyes. 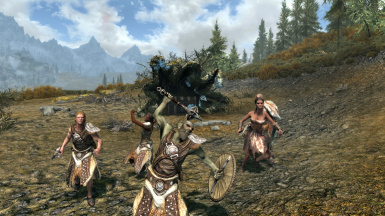 You can also put creatures that don't guard the treasure consciously but simply happen to live nearby for more variety. 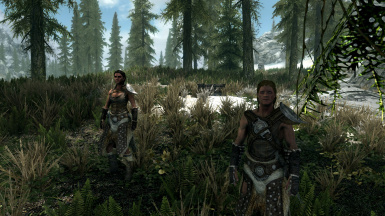 Also if you want to have a highly compatible mod you can create it while having the most popular location adding mods active so you do not add stuff to the same locations. And a personal requests. Can you add a version with 2x enemies or harder ones for people that play with more spawns? Wish you well and good luck with development. Thank you for the great recommendations that i will definitely take into consideration while updating the mod. As for how many chests there are i'm not entirely sure as i didn't keep track and i added too many to remember a specific number. But if i had to guess i would say there's 15-20 at the moment. I'm planing on adding many more chests and thanks to your ideas i'm thinking of doing a lot more too. Also if i can i will try to make a harder edition with more spawns. Great! I will be sure to keep an eye on this and see how it will evolve. 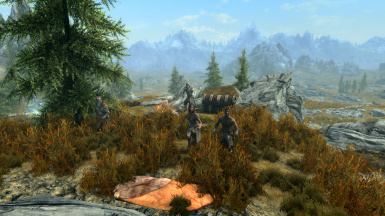 or you could make a boss fight instead of several bandits and whatnot. Maybe even some of the creatures from mihail monsters and animals. Just an idea. Excellent, I love the surprises. I'm glad you do thanks for the compliment. Nice simple idea. It's like Breath of the Wild a bit, just random chests to find!